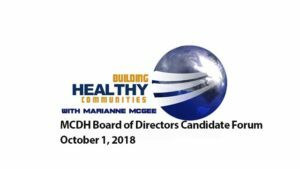 The League of Women Voters of Mendocino County has announced that a Candidate Forum for the Mendocino Coast Health Care District Board of Directors will be held at the Redwood Coast Senior Center.490 North Harold Street, Fort Bragg, CA on October 1, 2018, from 6:00 p.m. – 8:00 p.m.
>Each candidate will be given up to two minutes for an opening statement, followed with the candidates answering written questions from the audience. There will be a one minute response time or each answer. At the end of the forum, each candidate will have up to two minutes for a closing statement. Candidates may remain after the forum to answer any questions people may have. Please note that this is NOT a debate. The League of Women Voters neither supports nor opposes candidates or parties for any public office, but one of their missions is voter education, hence their sponsorship of this candidate forum. This event is open to the public; a League member will be the moderator. If you have any questions, please contact The League of Women Voters of Mendocino County at 707-937-4952.